After serving up his third critically acclaimed album ‘Horizons 03’ in 2013, Darren Tate is back with two subliminal cuts lifted from this pioneering EP. 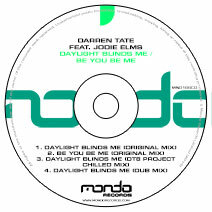 Following in the footsteps from 2013’s ‘All I Am’, Darren once again employs the raw and lush vocal talents of Jodie Elms to deliver two more forward thinking productions ‘Daylight Blinds Me’ and 'Be You Be Me'. 'Daylight Blinds Me’ can best be described as classic Tate, a beautifully crafted piece of music featuring lush pads, grooved fuelled bass lines and big room strings, all combined together with impeccable production. It will no doubt become a particular favourite with the global trance family. On the flip is 'Be You Be Me', an equally original and standout track with thumping progressive beats and synths. Coupled with Jodie Elms' unique and spine tingling vocals this is one guaranteed-to-please peak time euphoric dance floor beast! If that wasn't enough Tate in his DT8 Project guise delivers a cool, laid back mix on 'Daylight Blinds Me' which perfectly encapsulates that Ibizan summer vibe!